Jocelyn Frank, a DC based radio journalist/musician/documentarian/sound artist tells us about her awesome project Sound Garden. The idea is to create an audio installation that adds a bit of sonic beauty to an area or neighborhood of DC that can use a little beautification. The Awesome Foundation grant helps to fund the creation and exploration of best-styles/shapes for the project to take. Audio engineer Sean Phillips and I are working together to try out a few different configurations of solar power, battery life, motion sensors, wiring and security to create audio flowers that will be durable, weather resistant, secure and attention grabbing in order to create a small garden in an under appreciated area of the District. Once we’ve developed a working prototype we hope to solicit additional funding for a city-based project to be installed and enjoyed! DC is a creative city. Winning the Awesome Foundation grant helps us to contribute to and celebrate that energy in DC. Hopefully our sound garden will also help highlight an area that has its own charms but may have been overlooked or under appreciated. Hopefully our work can help inspire even more awesome projects in the future. The Awesome Foundation grant helps Sean Phillips and I build a prototype for our Sound Garden – but one flower doesn’t equal a garden. 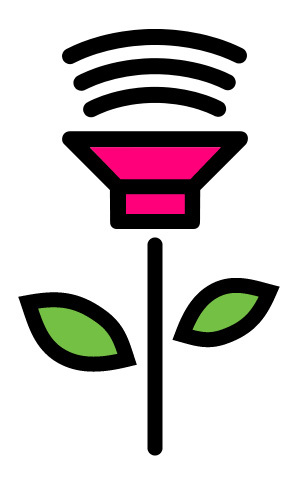 Once we have a working model we need support to “plant” (construct) multiple audio flowers in a plot (a neighborhood or business area). Support first and foremost is needed financially to fund creation of additional flowers and secondly, donation of space — in the form of plots, identified by businesses and/or neighborhood associations. Resident “scouts” on the ground who know of areas that could use an auditory boost, you’re insights are very welcome.